Simpli’ is a Gaelic word for simple and straightforward. My dear friend, J, is the artist who is handcrafting small batch soaps and body products. She comes up with her own recipes, selects incredible “good for you” skin products, and works diligently to use high-quality ingredients to make her soaps, beard products, and body butters. The scents alone are wonderful but the fact that her items are made with such pure ingredients is even better… until she started making soaps with WINE! How cool would it be to use a soap made with wine? Chardonnay, Cabernet, and Pinot Gris all have their own place in Simpli’ soaps. Each has a wonderful scent, cleansing lather, and is handcrafted in Northern Virginia. These are a wonderful example of an artisan combining two of her passions… wine and crafting soaps. I recently visited with J at her home and had the privilege to watch as she created a cooked soap and it was a really fun experience. Watching the ingredients come together to thicken and become a soap, ready to cool in a handmade loaf pan, was fascinating… and the smell was intoxicating! If you live in the Northern Virginia/DC area, you should consider finding this company at one of the local craft shows that are coming up this holiday season. At the very least, you should consider looking through the Simpli’ shop for soaps, body butters, bug balm, salves, and deodorant. J has been very generous and is offering a special coupon code to anyone who subscribes to this blog! Sign onto her website, www.simpliartisan.com and use the coupon code BOTWINE17 to receive 10% off everything in her shop… but don’t delay because this coupon expires on 12/31/17. It’s summer! The time of fresh fruit and lazy days… the time when you want to be able to go outside and enjoy your friends and family… the time for easy or starter recipes… This is when I like to have a few recipes on hand that make my life a little easier, especially on those days when the temperature is high and my energy is not. For those days, I give you the Summer Watermelon Salad! This recipe couldn’t be easier… four ingredients and easy to adjust for the number of people you’re feeding! This is actually one of my favorite lunches… light and simple, it just screams “SUMMER” to me. Watermelon – cut into bite-size pieces. Use as much or as little as you like, but this is your *main* ingredient. I typically use about 3 cups. Feta cheese – I like to use crumbled *light* feta, but you can use whatever type makes you happy. I dump in some from the container – about 1/2 cup. Basil – if I have fresh, I take a small handful and cut into a chiffonade (little ribbons). If not, I take a generous pinch of dried. I’ve done both and fresh is definitely better in this – it’s a wonderful flavor! White wine – I use what I have in my fridge, about 1/8-1/4 cup total. I’ve used dry (Chardonnay and Pinot Gris/Grigio) and I’ve used semi-sweet/off-dry (Vidal Blanc and Viogner)… use what you like! Cut watermelon into bite-sized pieces and place in a large bowl. Sprinkle with feta cheese and basil. Toss lightly and adjust amounts as needed. Thumb 1/8-1/4 cup of white wine over the salad and allow time to marinate before serving. I typically drain a bit of the liquid off before serving. This ends up being a mixture of wine and watermelon juice that isn’t really necessary. This is a great example of how I use “The Force” when cooking… so many variations to make this salad and it’s always delicious. Hope you’ll try it and come up with your own favorite way to make this salad! My neighbor had a health issue with her mom last night and I thought that the nicest thing I could do for her would be to make dinner and dessert for them tonight. I know her mom loves sweets, so I had to make sure to have some sort of dessert included, so I made a platter of chocolate chip cookies, since I already had the dough in the fridge… the question was now “what do I make for dinner”? I looked through my freezer and found a package of turkey kielbasa and a half package of bacon, so that became the base of my recipe. Since I also had some green peppers and an onion in the crisper, I decided to make a turn on a “sausage and pepper sandwich” and add some linguine and a creamy cheese sauce to pull it all together. Here’s how I went about making dinner. NOTE: Remember that I was making two dinners for two people each, so these could have easily been made into a single 9×11 casserole instead of two individual 9″ round casseroles. I crisped up the half package of bacon and then removed the bacon to a plate, leaving the bacon drippings in the saute pan. I diced one package of turkey kielbasa and crisped that up in the saute pan as well before removing that to a plate. I sliced one green pepper and half a large onion and sauteed these in the bacon grease until softened. While cooking all these individual pieces, I cooked 3/4 package of linguine (broken in half) until just al dente, then drained the pasta, saving some of the water in case I needed it for the sauce that would top the entire casserole. I then assembled the casseroles, placing a little of the bacon and half the kielbasa and half the vegetables on top before adding half the pasta. Once this was done, I was able to turn my attention to the sauce. I wanted something that was creamy and slightly cheesy but didn’t just want to throw cheese on top of the pasta and hope it melted correctly. I started the sauce by simmering 2T butter and 2T flour together to make a roux. I then added some white wine (using chardonnay was my choice this time… crisp and clean) and chicken stock to start a great tasting sauce. To make the taste unique to this particular dish, I added half a can of cream of mushroom soup (leftover from Christmas dinner), some parmesan cheese and some cheddar cheese for creaminess and a few dashes of Worchestershire sauce for flavor. 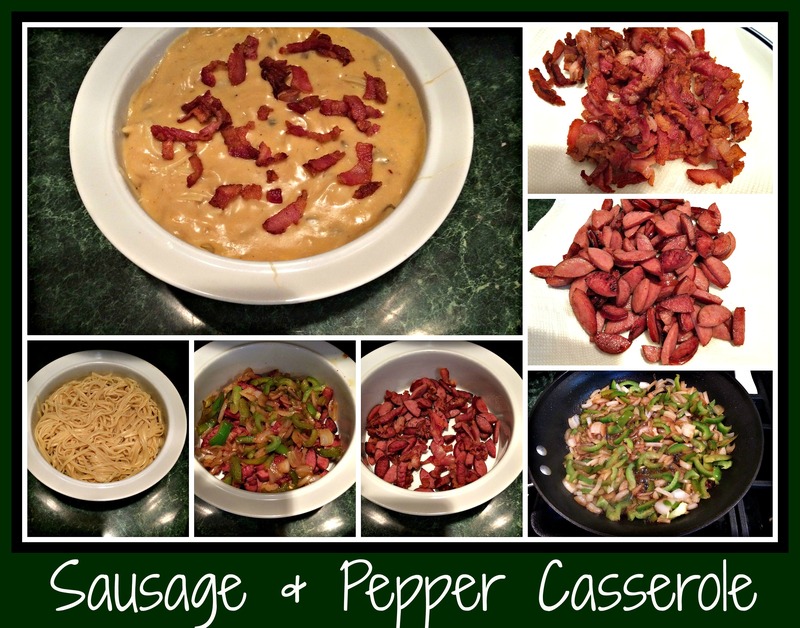 Once the sauce tasted “right” (you HAVE to be willing to taste your sauces during the cooking phase so they balance out once they’re added to a dish), I poured half over each casserole and topped each with a sprinkling of leftover bacon. I have no idea if my neighbors will enjoy this casserole, but I hope they feel the love that comes from wanting to do something nice for others in times of stress. Karma is a tricky thing… but I believe that if you always reach out to others in a positive way and from a place of kindness and love, that same thing will come back to you tenfold. I’m not expecting them to do anything in return…. I just know that they shouldn’t have to worry about feeding their family when they’re facing a difficult time. May we all approach life in this manner… give when you can and your life will be made better for the effort. Happy New Year Blessings to you all, my friends. Wishing you health and happiness as 2015 begins! I have a confession to make… I’m usually lousy at cooking salmon. Since I found two pieces on “mega-sale” at the store today, I thought I’d give it one more try to see if I could come up with something really yummy. I have to say that this entire meal ended up being one of my favorites… and it was ridiculously easy! This post isn’t just a recipe for dinner, it’s also got a great side dish (I serve these potatoes for Easter EVERY year) and a salad dressing. If you’re looking for an easy and impressive dinner, this is it. Yum! Season the salmon fillets with salt and pepper. In a hot saute’ pan, melt coconut oil and then sear the seasoned side of the salmon filets. As the salmon sears in the hot oil, blend the glaze. You’ll need to warm the jam for 10 seconds in the microwave. You’re not trying to melt the jam… you just want it loose enough to blend with the vinegar and wine. You’ll want to adjust the seasonings with a little salt and pepper…. make sure to taste the glaze before using it. Once the one side of the salmon is nicely browned, turn the fillet over and pour the glaze over top. Since the salmon won’t be thoroughly cooked, I put the entire pan into the oven and allow the fish to roast until dinner is done. NOTE: I started the potatoes about 30-40 minutes before I began making the salmon, so the house already smelled amazing before I started on the fillets. Bake in a preheated 375 degree oven for 45-50 minutes or until potatoes are fork-tender and the top is bubbling and browned. This recipe showed me that, with a little ingenuity and imagination, I could create a fabulous, easy, “guest-worthy” meal that would satisfy all my expectations. This is a starter recipe that will impress the pickiest visitor… try it and see what YOU think! BONUS RECIPE: I’d like to share my absolute favorite salad dressing recipe with you. This recipe makes an impressive amount of dressing that is much lower in calorie than you’d ever imagine. I have NEVER actually measured the ingredients for this dressing, so you’ll have to forgive me for not including any. Mix ingredients together and toss with thinly sliced romaine. This is full of flavor and better than you’d expect! 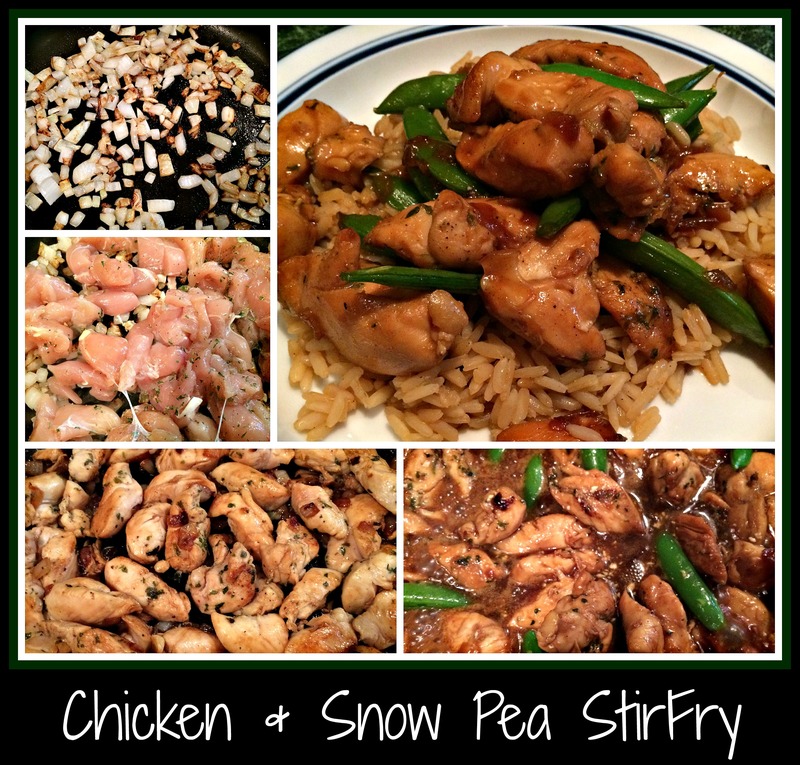 As promised via Instagram, I am posting my recipe for a delicious and amazingly simple dinner of chicken tenders, snow peas, and brown rice. I have gotten this dinner down to a quick and easy “go-to” for our family and have altered it too many times to count. I am sharing this basic version so you, dear reader, have a place from which to “jump off” and create something that will appeal to the individual tastes of your own families… so let’s get to it! I started with one package of chicken tenders and most of a bag of snow peas. I cut each of the tenders into bite-size pieces and then added salt, pepper, and parsley before setting the chicken aside for a few minutes. In a large skillet, I melted a bit of coconut oil on medium-high heat and browned half a diced onion, Once the onion was browned, I added the chicken tender pieces and gave them time to cook thoroughly before adding the sauce. I created the sauce by pouring about a cup of Chardonnay (I used Bread and Butter Chardonnay, because that was what I had in my fridge… feel free to use whatever white wine you have or prefer) into a bowl, adding a large glug of a pre-made sweet and savory sauce from Sam’s Club that we had in the fridge, along with a “thumb-size” amount of cream cheese, and pouring that into the skillet. I added the snow peas and stirred everything together until the cream cheese had melted into the sauce and the peas had a chance to cook a bit. I then served the stir-fry over a bed of brown rice. I should also note that I added a bit of the same “sweet and savory sauce” into the rice when it was cooking, so there was some syncing of the flavors between the stir-fry and the rice. Honestly, this is all I did to make dinner last night. I have made variations in which I substitute the sweet and savory sauce with some pre-made housin sauce but I’ve also done the same thing using wine, the juice of a lemon, and some light-colored jam (I like apricot, peach, or fig preserves). Play around with this recipe on your own and find your favorite version to serve. It’s amazing how fresh and wonderful things taste when you play with ingredients! Dinner last night was one of those “comfort meals” that everyone talks about… meatloaf and mashed potatoes… classic, right? I have a habit of taking classics and adding a new “wine’d up” spin on things, so this dinner was no different. I was craving meatloaf and I had a small bag of baby carrots in the fridge, so I came up with a way to cook both dishes at the same time. Brilliant, right? Actually, it was more of a fluke the first time I tried it last week, but it really does work! I started out making the meatloaf. I used one package ground turkey, two palms full of seasoned bread crumbs, some dark red wine (I used a Cabernet Sauvignon that my neighbor had given me… yummy! ), a hefty squirt of dijon mustard, some Montreal Steak Seasoning, an egg, and some parsley. I mixed everything together until it was nicely combined (feel free to add a little more of the bread crumbs if it’s too moist). Then I assembled the baking portion of the meal. Using a loaf pan, I sprinkled a layer of baby carrots on the bottom of the pan and poured some white wine (I used the Chardonnay I had in the fridge) over top. I then put a large piece of foil over the carrots, to create a new “loaf pan” for the meatloaf, and sprayed it with cooking spray. I formed the meatloaf into the pan and made a bit of a well down the center. Before I popped the pan into the 375 degree oven for an hour, I added a touch of ketchup on top for color and sweetness. 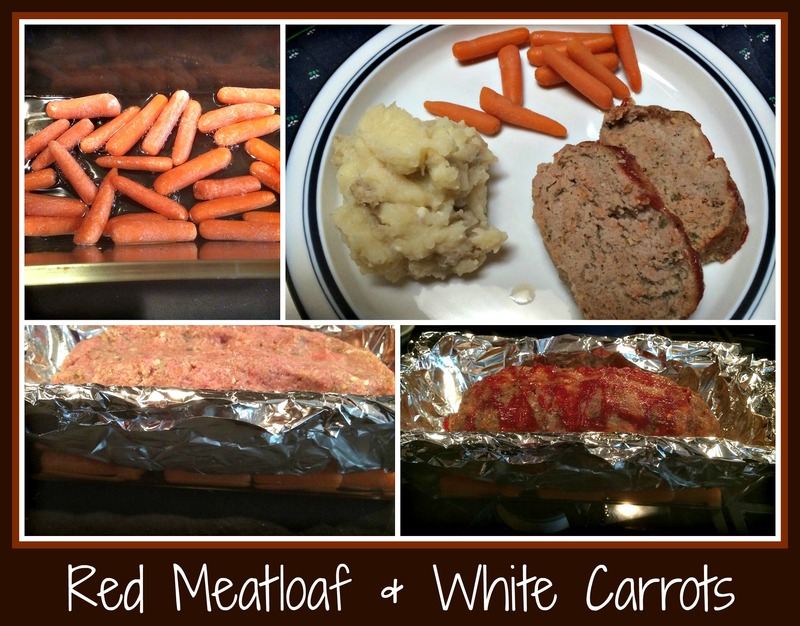 DOnce the meatloaf had cooked for the hour, I removed it and let the pan sit for 5-7 minutes before lifting the meatloaf off the carrots and slicing the loaf for dinner. The white wine had cooked the carrots to a perfect al dente’ and the meatloaf was dense and tasty. Adding some homemade mashed potatoes was just the perfect accompaniment. If you’re looking for a simple way to make comfort food, this really did it for me. I hope you’ll try it and let me know how it turns out for you! Enjoy…. 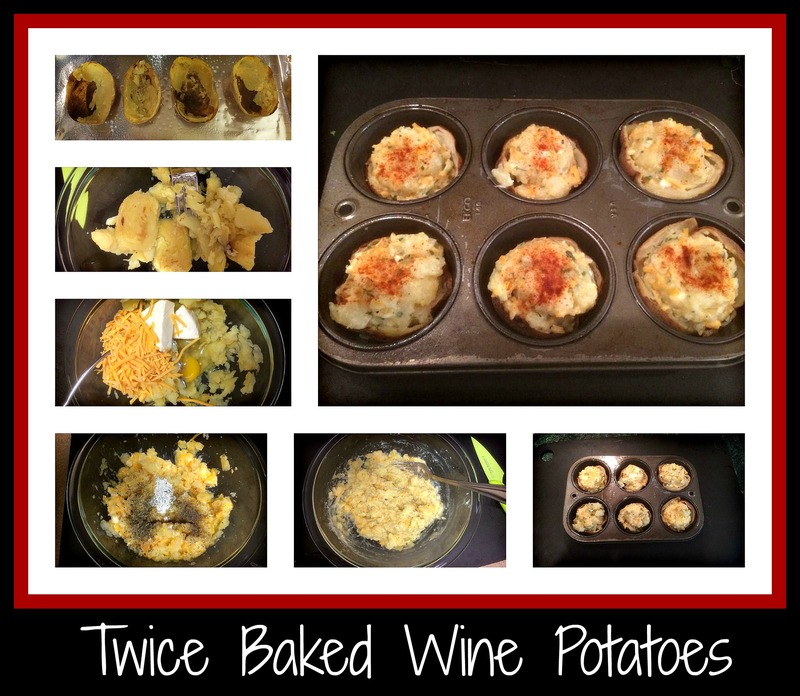 As promised, here is the recipe for my favorite Twice Baked Wine Potatoes. I have been making these for quite awhile now. I alter the recipe each time, depending on the flavor blend I want to have for the meal it might accompany, so it really does work for so many meals. I’m sharing the basic idea, but please feel free to adjust and play with the recipe to suit your own family’s tastes and preferences. I like to use Yukon Gold potatoes for this recipe. NOTE: the number of potatoes you bake depends on how many servings you want in the end, but for the two of us, I tend to bake three potatoes so I end up with six small twice-baked potatoes. Feel free to bake your potatoes however you like, but I typically will cut a small slice in the side of the potato (this will end up being the start of my cut to slice each potato in half) and bake the potatoes at 350 degrees for 45-60 minutes. Once the potatoes are cooked, I remove them from the oven (remember that they’re hot, so use oven mitts so you don’t burn your fingers) and slice them in half, lengthwise. Using the oven mitts and a spoon, scoop out the cooked potato and collect it in a bowl large enough to mix any/all ingredients. NOTE: If you want to use a mixer for this part, you can put all your potato innards into your mixing bowl… I just like the more rustic feel I get from using a hand masher, similar to one my mom used to use. Once you’ve scooped out all the potato skins, your cooking fun begins! For the recipe pictured here, I first added the following ingredients: shredded cheese, one egg, a spoonful of margarine, some great tasting white wine, and a wedge of Laughing Cow lite cheese. Once I mashed these together, I needed to adjust the seasonings so I added a spoonful of Greek yogurt, salt, and some freshly ground pepper. NOTE: I have used a spoonful of Bourcin Cheese on occasion and this has also been a great addition. The egg can be omitted, but I find that it adds a touch of richness to the final product that is otherwise lacking. Feel free to use a Fat-Free Egg Substitute if you prefer, but using only the egg whites won’t produce the same texture – experiment with your favorite ingredients on this one. Once the mashed potato mixture is to your liking (make sure to taste this part), I use a small cookie scoop to fill the potato skins so I know that I’m filling everything evenly. You can simply line up the filled potato skins onto a baking sheet, but I have found that I really like to place the potato skins into a muffin tin and fill them inside so they don’t end up rolling off to the side and are easy to store until you’re ready to bake them. I’m one of “those” people who thinks about dinner early in the day, so if I have the completed Twice Baked Potatoes sitting in my fridge for the day, it’s so much simpler to have them contained in a muffin tin. NOTE: This is a recipe that you could easily double and make over the weekend – freeze anything you don’t want to use right away and then you have a perfectly simple side dish available for any night of the week! I’m a huge fan of “make-ahead” foods that can be stored in the freezer. To bake these little darlings, just pop them into a preheated 375 degree oven for 30-40 minutes or until they’re cooked through and lightly browned on top. I love the crispiness of the potato skin and think that it’s a wonderful complement to any meal. I’ve served it with BBQ chicken, steak, lobster, shrimp, burgers… almost anything looks fancier when you put these out as your side dish! Hope you’ll try this and see just how easy it is to make such a fun side dish… our family loves them and I’m sure yours will too!